News: December classes at AS220 Industries! MEDIA ARTS All about photography! Workshops in digital photography, studio lighting, the Adobe Creative Suite, editing and post-production! Intro to Podcasting Tuesdays December 4th, 11th and 18th, 6 to 9pm. In this workshop, we will talk about different kinds of podcasts, what makes a good podcast, and go over the basics of recording and editing a podcast episode using Hindenburg Journalist, and publishing a podcast using a service like ShoutEngine, Libsyn, or Podbean. It’s recommended that you listen to at least one podcast before starting this class.Cost: $130. Software Basics: Photoshop Mondays December 10 and 17, 6-9pm. Introduction to Photoshop will allow participants to learn the basic tools and uses of Photoshop CC including scanning artwork, photo correction, resizing, working with text and saving your files. We’ll also dive into using layers, effects, and masking. After the first session, students will work through a series of exercises to better understand Photoshop’s many features. Cost: $100. Intro to Blender: It’s Not a Tumor! Saturdays December 8 and 15, 11-2pm   Learn the very very very basics of Blender, a professional, free and open-source 3D computer graphics software used to create animation, visual effects, art, 3D printed models and more! The workshop will focus on getting started with Blender, basic modeling and sculpting, applying textures, lighting, simple animation and exporting. Cost: $100. Advanced: CNC Milling Machine  Saturdays December 1 and 8, 2-6pm. This workshop is for anyone that has completed the Shopbot class and wants to machine small metal parts. You will learn how to safely operate the machine on your own, so you may use the machine independently after completing the training and becoming a member. Cost: $145. Soft Plates II: Low Relief and Collograph. Saturdays December 1 and 8, 11am to 2pm  ‘Soft plates’ are thin substrates like paper, plastic, and vinyl are made into semi-durable shapes, that are capable of holding fixed details, etchings and carved lines. Students will learn how to develop these low relief layered plates to be printed as relief or as intaglio plates. This class will teach proper press operation and certify members to use the etching presses on completion. Cost: $150. Intro to Letterpress: Polymer Plates Saturdays December 1 and 8, 2pm to 6pm  This class will cover the old and new uses of the letterpress using light-sensitive polymer plate to be printed on our Vandercook press. Students will get a basic foundation for Letterpress printing by focusing on the production and printing of the polymer plate. Cost: $150. Letterpress Your Holiday Cards Sunday December 9, 10 am to 1 pm   This brief introduction to letterpress printing will help students gain a better understanding printing process while getting time on the Vandercook press. Students will get to select a design from a curated suite to print on cardstock. The goal of this workshop is to expose students to the letterpress printing process through a hands on approach. Cost: $65. 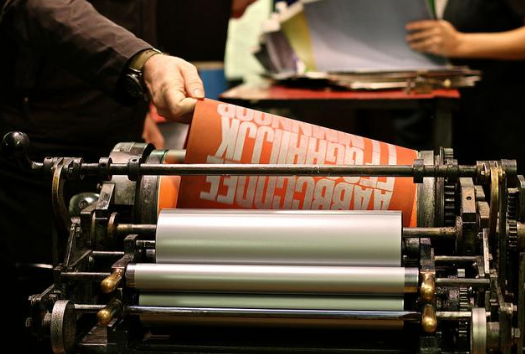 Advanced: Graphic Letterpress, Saturday December 15, 10am to 1pm. Typophile beware, you may fall in love with this unique hand typesetting class. Graphic Letterpress is meant for the printer who wants a chance to break the rule (now that they know them). Students will get a chance to play with type in unconventional ways to create expressive broadsides.Cost: $70. Silkscreen Intensive Sunday December 16, 10am to 6pm    Screenprinting is a versatile process that can be used to transfer graphic images to paper, wood, and fabric. It is ideal for making prints, posters, coasters, greeting cards, stationery, and more. Your instructor will walk you through the process and help you gain the skills you need to confidently plan and execute your next paper based project.Cost: $130. Interested in teaching a class? Email industries@as220.org and pitch your idea!